Greg Cook, one of Adelaide’s more accomplished guitarists, launched Guitar Impressions more than fifteen years ago. In recent years he has gained valuable experience through his extensive travels throughout Asia, and has had the pleasure of enjoying many interesting and varied musical experiences. These experiences have led him to research some of the instruments and musical styles encountered along the way. His overseas experiences have enriched and benefited his growth as a musician and guitarist; not to mention as a person. Greg hopes to share some of this knowledge and experience through his teaching and musical performance. Greg is a full member of The Music Teachers’ Association of South Australia, and a registered member of the Institute of Music Teachers (National Accreditation for Studio Music Teachers in Australia). Before his explorations abroad, Greg had had employment with TAFE SA Flinders Street School of Music as a guitar instructor, Adelaide University Elder Conservatorium as an assessor of guitar students at all levels, and Adelaide University AMEB (Australian Music Examinations Board SA/NT) as an examiner for guitar. His work for these great Adelaide institutions was considered by all to be exemplary in every way. Greg is interested in keeping his musical explorations fresh and vibrant, and as a result of this interest, he continues to pursued a diverse range of styles. 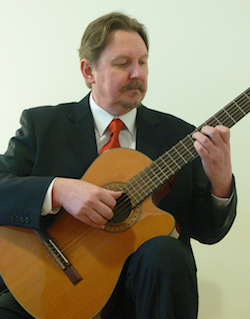 As a ‘Fingerstyle’ Classical Guitarist, Greg explored music from the Classical, Baroque, Romantic and Renaissance periods in his initial foray into music. Following this exploration into the more ‘traditional’ repertoire of the ‘Classical Guitarist’, Greg expanded his exploration to include other styles of music including Jazz, Blues, Latin and Spanish music. Exploring these styles exposed him to improvisation techniques which have since become integral to Greg’s guitar playing. In fact, he is a strong advocate and practitioner at the forefront of the re-introduction of improvisation as an essential mode of musical expression for the Classical ‘Fingerstyle’ Guitarist. Song accompaniment has also become a strong interest through his ‘Renaissance Song’ (especially the songs of John Dowland) , ‘Blues Song’ (especially traditional Country Blues styles) and ‘Jazz Ballad’ explorations. In recent years Greg’s music has been influenced by Indian and Oriental musical styles, as a result of living and undertaking extensive travel throughout China and India. These recent explorations have further enriched and expanded his musical horizons. Greg believes that the Classical ‘Fingerstyle’ Guitar technique is a versatile playing technique that can easily be employed to play repertoire and improvisation, in a variety of styles; and opens up a ‘world of musical influences’ to the guitarist.